La Estación Biológica Laguna de Apoyo ya es dotada de un animal más. Esta vez, no es un animal silvestre, sino una perra. 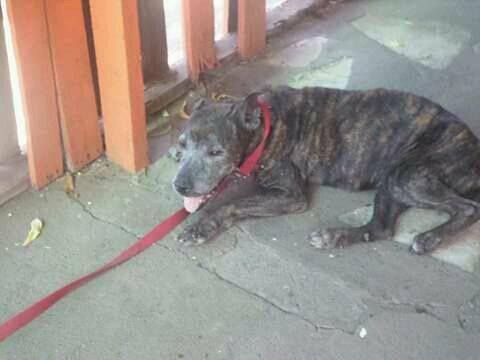 Lassie, una pitbull viejita que pertenecía a un músico de reggae y calypso de renombre en Managua, fue botada a la calle, por ser vieja, por ya no tener el encanto de ser cachorra, por estar enferma, por depender de una familia sin recursos para pagar el costo de curar sus heridas. Pero la verdad es que Lassie no fue botada a la calle por ninguna de esas razones. Fue botada a la calle por la falta de afecto, de conciencia, por tener el corazón encogido los miembros de la familia que decidió olvidarse de ella. Lassie al momento de su rescate en Managua. Foto Lorena. Cuando nos dimos cuenta de Lassie, nos hizo pensar que podríamos asumir la responsabilidad de darle cariño, comida y casa el resto de su vida. Estamos acostumbrados a los animales silvestres, pero esta vez adoptamos una perra! 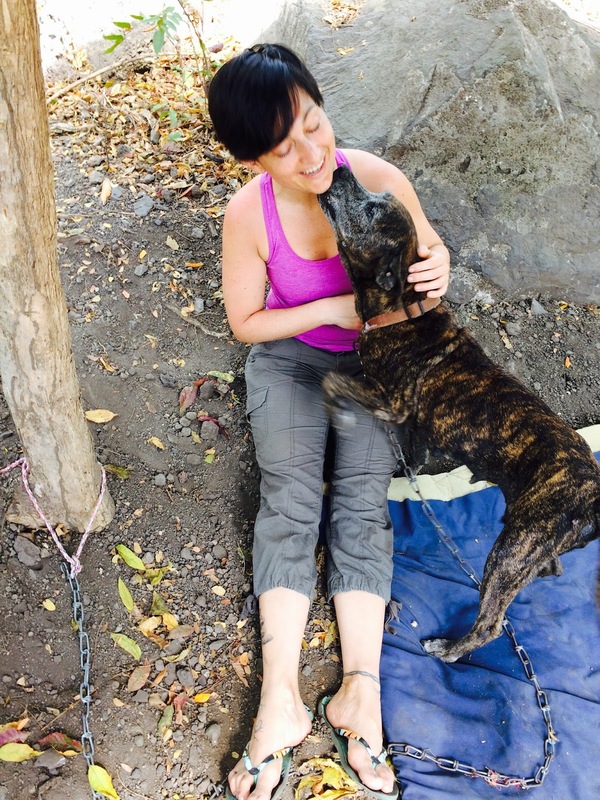 Lassie en su hogar temporal en Managua, después de ser rescatada por los ángeles de la Fundación ADAN. Foto Lorena. Los voluntarios de la Fundación ADAN se llevó a la perrita Lassie hasta la Laguna de Apoyo, donde nuestro equipo la adoptó. La pobre perra, viejita y enferma, ya en un lugar nuevo, tuvo que ir adaptándose a nuevas personas, y lugar nuevo, y hasta una perrita con quien estaría compartiendo espacio. Poco a poco, iba reconociendo a las personas nuevas en su vida, hasta decidir adueñarse de un pequeño solar con techo, en el patio de la propiedad de la Estación Biológica. Lassie comiendo en su solar. Foto Julie Comeau. Rápidamente, Lassie desarrollaba confianza con nosotros. También, ella aprendía del terreno físico, dónde es de ella y dónde no. Ahora, después de pocos días, ella se siente en casa. Su rescate ha sido exitoso! Lassie quiere mucho a las personas que manifiestan amor con ella. Foto Julie Comeau. Esperamos dar mucho a Lassie, amor, comida, salud. Ya sabemos que a nosotros, nos va a dar mucho más que nosotros a ella. 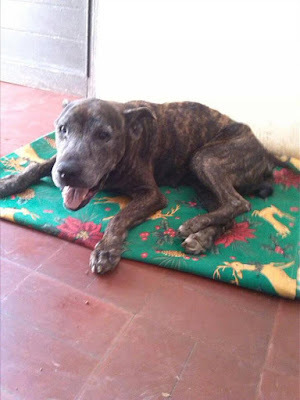 Ella fue olvidada por una familia, pero ahora es parte de otra familia que promete a cuidarla y compartir amor con ella. Nuestros voluntarios se dedican a darle cuido y afecto. Si quieres ayudarnos con alimento o con tu tiempo para nuestros animales silvestres (y domésticos) rescatados, contáctanos! Puedes ayudarnos con el rescate animal! Haz click en el escudo para contactarnos! Although birds are not always easily photographed in the wild, some people are up for the challenge. The following photos were taken by Lars Saenger, who spent two weeks studying at Apoyo Spanish School and watching nature inside the Laguna de Apoyo Nature Reserve. These photos demonstrate that the area is great for practicing nature photography. Osprey (Pandion haliaetus) populations found in Nicaragua do not breed locally. The entire Osprey population of Nicaragua is regarded as migratory, nesting further north. Some birds pass through Nicaragua on migratory trips, but many choose the ample aquatic ecosystems to fish in Nicaragua until moving northward for another reproductive period. Ospreys feed almost entirely on fish plucked from the surface of water. 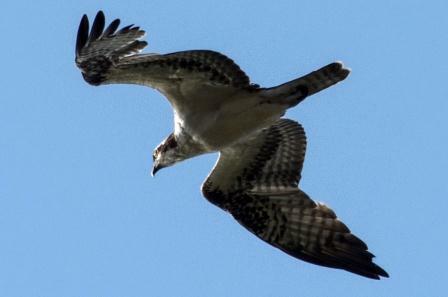 Even though the Osprey does not nest in Nicaragua, there are always a few individuals present in Laguna de Apoyo, most likely immatures that remain behind in their southern range until ready for reproduction. Most of the bird species found in Nicaragua have wide ranges, often spanning many countries. Some, however, are found in more restrictive ranges, within an ecosystem. One such bird species, Hoffmann's Woodpecker (Melanerpes hoffmannii), is located only in Honduras, Nicaragua, and Costa Rica. The species prospers in both open areas with plenty of trees and natural forest areas in the tropical dry forest region of Nicaragua. Laguna de Apoyo Nature Reserve is an ideal habitat for the bird, which is a close relative to and shares many superficial characteristics with the Red-Bellied Woodpecker (Melanerpes carolinus), a species common through much of the eastern United States. 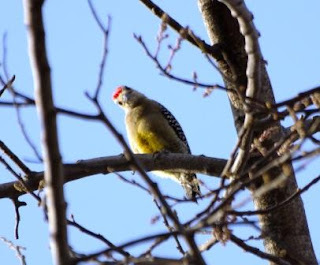 Hoffmann's Woodpecker is active in most areas of the reserve year-round, including both the deepest forest areas and built areas with houses. Some birds prefer to inhabit areas without human influence, but others may be particularly attracted to humans. One bird that responds positively to human impacts on the forest is the Great-tailed Grackle (Quiscalus mexicanus). They tend to be active throughout the day, loud and ebullient, and many other species do not prosper in their presence. They are not found deep into the forest. 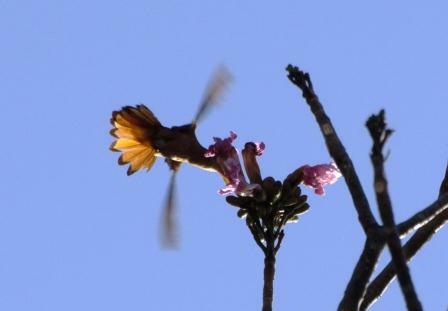 Cinnamon Hummingbird (Amazilia rutila), feeding on the nectar of Tabebuia rosea. Hummingbirds are always loved by birdwatchers. Their precise movements and delicate forms inspire awe among anyone who sees them. Among the most common hummingbird species in Laguna de Apoyo Nature Reserve is the Cinnamon Hummingbird (Amazilia rutila). It and other hummingbirds consume nectar from flowers, as everyone knows; what fewer people appreciate, however, is that hummingbirds also consume very small arthropods, which they may glean from the air. One example of such prey is the juvenile spiders, that may actually be transported by the wind. The Cinnamon Hummingbird will feed on tiny spiders, often gleaning them from foliage and flowers. 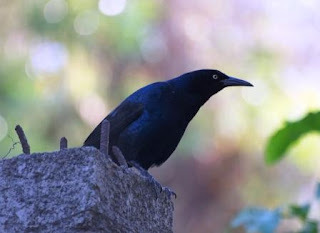 This bird species is common particularly near humans, and is even found in peri-urban areas of Managua. Many species of tyrant flycatchers have been documented in Laguna de Apoyo Nature Reserve, among them, the Boat-billed Flycatcher (Megarhynchus pitangua). 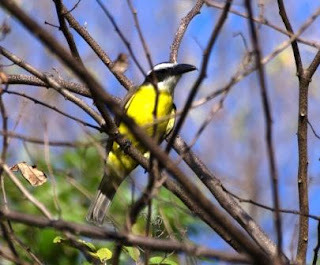 At first glance, it resembles the Great Kiskadee (Pitangus sulfuratus), but without cinnamon wing-feathers, and with a much more formidable peak and distinctive calls. It can be found in open areas as well as within a relatively closed canopy. 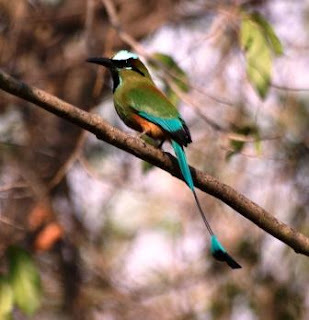 The bird most adored by Nicaraguans is the Turquoise-browed Motmot (Eumomota superciliosa). This lovely species is very common in Laguna de Apoyo Nature Reserve, likely because of the abundant sites for nesting available. The species makes nests in tunnels carved horizontally into loose clay and ash deposits in the steep banks in ravines and road cuts. This site may be among the best to find the species in the entire country. 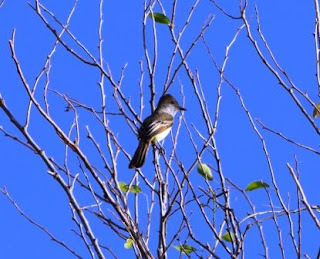 Among the numerous species of tyrant flycatchers in Laguna de Apoyo Nature Reserve, is the Dusky-capped Flycatcher (Myiarchus tuberculifer). Its genus consists of several species, some of which are quite difficult to distinguish at a distance. It is common throughout the reserve. 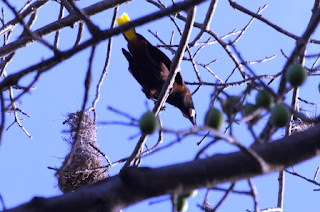 Birdwatchers never tire of watching the Montezuma Oropendola (Psarocolius montezuma), especially around a nesting colony. Dozens of nests in the form of woven socks are constructed in a single tree, where the birds engage in highly social behavior among the nesting group. Nesting occurs during the dry season, sometimes starting as early as November, with as many as one hundred birds gathered into a single site! An oropendola colony is always a birdwatching paradise. Please contact us for a birdwatching tour in Laguna de Apoyo Nature Reserve or anywhere in Nicaragua. We organize expeditions in all locations of the country, and we would love to take you! Click on the "escudo" to contact us at Gaia. There is an amazingly complex set of conflicts between people and wildlife, much more extensive and complex than anyone can appreciate. Humans impact wild animals in their natural environment in numerous ways, and for most wildlife, the impacts are negative. Birds may almost always be seen near areas of human activity, but several species of birds are not compatible with humans or with the birds that are compatible with humans and accompany them. 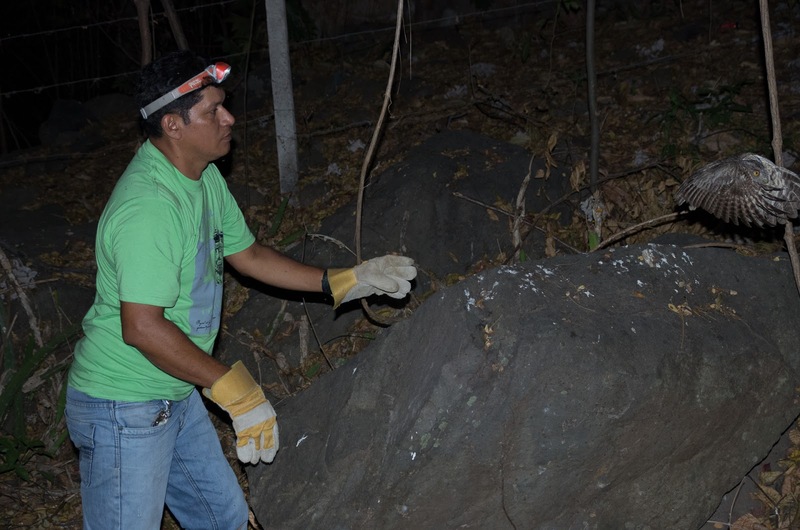 At Estación Biológica Laguna de Apoyo, we often see, up close and personally, the clashes between humans and wildlife, and wildlife rarely prospers from the impact. Animals may end up hunted, abused, captured for the pet trade, or victims of habitat alterations and destruction provoked by humans. Often, wildlife die or appear injured or disabled and in need of wild animal rescue, thanks to the many ways humans encroach on wild environments. We feel gratified and awed, however, by the kindness shown by a family visiting the area and the happy ending for an owl. This family had noted an owl in distress in standing water, near the lake, and upon our suggestion, brought us the poor bird. It was obviously in severe distress, completely defenseless, and at risk of getting attacked by pet cats in a yard. The owl appeared to be in shock. We took the owl, wrapped in an old shirt, and placed it in a cage, and waited. We gave it a small amount of water, and then left it alone, warm inside a cocoon to recover from the shock it was experiencing and guarded from the distractions of daytime in a draped cage. The owl was clearly an adult Pacific Screech-Owl (Megascops cooperi). 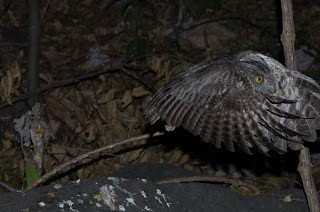 This is perhaps the most common and definitely the most evident of the owl species in Laguna de Apoyo Nature Reserve, particularly because of their willingness to reside in areas inhabited by humans. We have had some positive experience with this species, so we felt confident that we could feed it and give it a chance to survive and return to the wild. In the worst of cases, we could give it a restful end in a quiet place, if it indeed would not survive. The Pacific Screech-Owl is taken from the cage, prepared to return to the wild. Photo Lars Sanger. 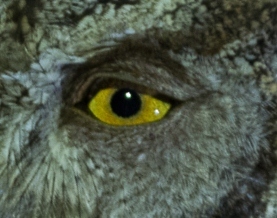 Within a few hours, the owl had recovered considerable energy. By the end of the day, it was sitting on a perch, and showing a much better posture. Then, an egg appeared under the perch! The egg had cracked in the fall, but nonetheless, it helped explain the distress of the poor animal. 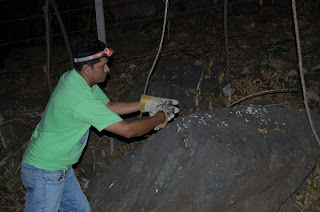 Encouraged by the event and the improvement of the spirits and energy of the bird, we gave it lots of food, in the form of Asian house geckos (Hemidactylus frenatus), an invasive species which abounds around artificial lights in the area. After two evenings and days of comfort and food, it had not produced another egg yet, but it (or rather, she) was calling in the evening and receiving a response from the trees above. Could it be her mate? 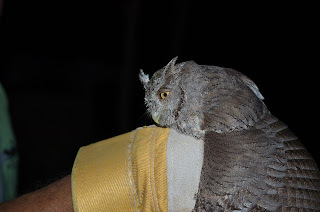 Pablo Somarriba prepares to release the Pacific Screech-Owl. Photo Lars Sanger. A recent evening, Pablo removed her from her cage, took her to a nearby secluded area, and released her. She did not hesitate. Within a fraction of a second, she had flown. She landed in a nearby tree, where she perched to assess her new freedom and examine the surroundings. The Pacific Screech-Owl returns to the wild. Photo Lars Sanger. Most birds and other wildlife affected by humans perish without notice, victims to cats, dogs, and to the transformations to habitat caused by human inhabitation. Even when people think they are making their country home compatible to wildlife, they may be eliminating a lot of elements of habitat vital to the natural order that is found in the ecosystem, such as undergrowth. Other impacts may involve pets. Cats are now understood to present a huge threat to wildlife. 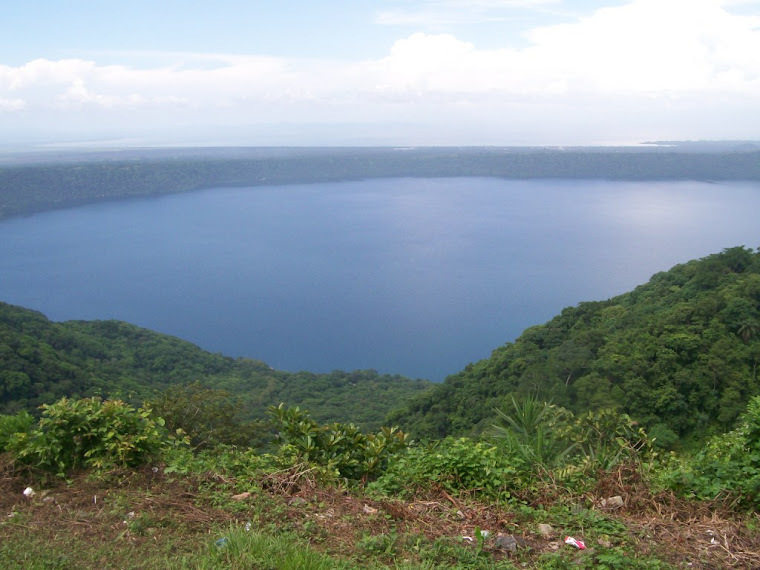 These issues are grave in the context of the Laguna de Apoyo Nature Reserve, where human activity is intense. It is one of the most visited protected areas in Nicaragua, with some 100 residences and hotels along the shores of the lake. Flight to freedom! Photo Lars Sanger. Seeing an owl in flight is always a great surprise. They seem to command the air, appearing without notice, and moving swiftly, without noise or flutter. This owl, in only a few wing-strokes, flew to a nearby branch and landed. Below is a video of her first flight. Our member of the neighborhood owl family is again in the wild, where she will, hopefully, reintegrate and go on to reproduce. She was saved from a sure death by dogs in a yard, and now, she has another opportunity to live and die in the wild as she was destined. We can appreciate the Pacific Screech-Owl in Laguna de Apoyo Nature Reserve almost any evening, by following the calls made within a family group. The members of a group frequently interchange a pleasant, bouncy call each evening. Occasionally during daytime, they can be spotted roosting in trees, sometimes just overhead of us in our daily activities. They are occasionally spotted during birdwatching excursions as well, because they may be roosting in plain view. 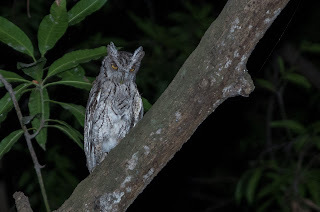 This is one of the owls most tolerant of the presence of humans, so they are more easily found than most other owl species in the inhabited areas of the reserve. 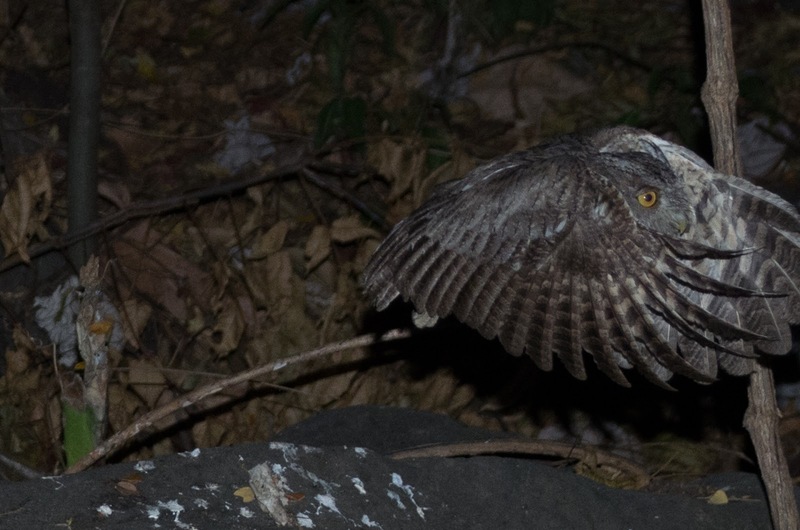 The Pacific Screech-Owl is now in the wild again! Photo Lars Sanger. Click on the escudo to contact us!